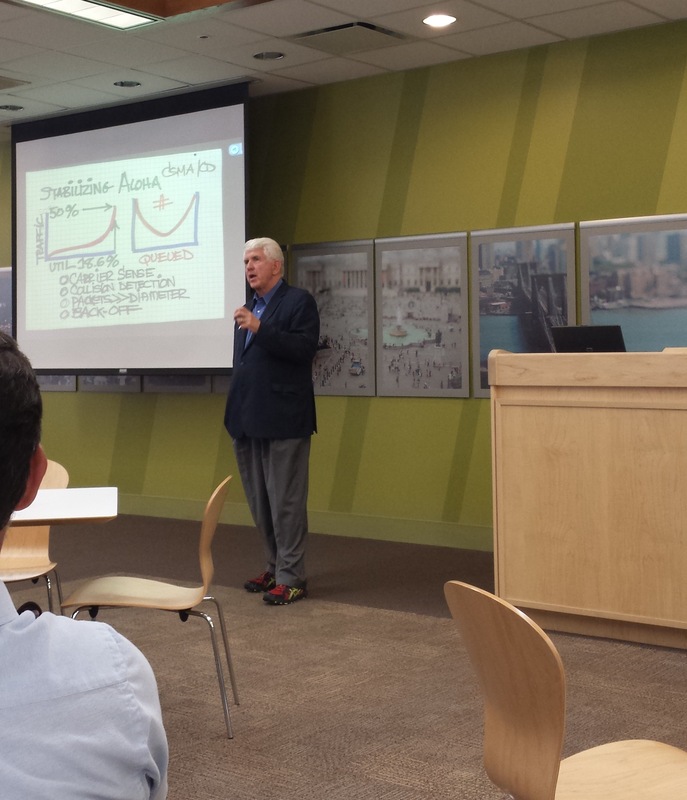 Earlier this month I had an opportunity to attend a talk by the most well-known co-inventor of Ethernet – Bob Metcalfe. In May, the networking world celebrated the 40th anniversary of the invention of Ethernet at the Computer History Museum, where Metcalfe was honored and invited to speak to employees of the company that he had founded in 1979 – 3Com. Of course, HP acquired 3Com in 2010, so he had really come to HP to talk on the evolution of Ethernet as well as what has kept him busy the past 40 years. Metcalfe began by stating that the design behind the Ethernet protocol he co-invented in 1973 had changed so significantly that he is often given far more credit than he deserves. Amusingly, however, he said he will not give that credit back. He believes that there is very little in common between the types of Ethernet standards we have today from the IEEE (Gigabit Ethernet, Ten Gigabit Ethernet, 40 Gigabit Ethernet, 100 Gigabit Ethernet) and the original 2.94 Mbps standard that he came up with with the intent of printing 500 dots per inch with a speed of one page per minute. The day of 1 Terabits per second Ethernet is not far off, with the dependency being on the IEEE assessing the availability of components in a timeframe so that devices can be made economically. Metcalfe spoke of the battles Ethernet had with Token Ring in the early days. Token Ring was heavily backed by IBM, but had rigid standards and was inflexible to the growing needs of the market. Ethernet, on the other hand, was able to spread widely because it constantly adapted, the prime example being the opening up of media support from thick-net coax to twisted pair cable. Ethernet also sought support for higher speeds, soon from 10 Mbps to Fast Ethernet (100 Mbps) by which time Token Ring with it’s support for just 4 Mbps and 16 Mbps was proven obsolete. Another reason Ethernet thrived, he claimed, was that it was not designed to solve every problem. For example, in the ISO hierarchy, Ethernet does not address Security (mainly because he felt it was not appropriate to solve that problem at the hardware level). Of course, now it is standard design to be cross-checking the source address field. He then went into a tangent of how he believes the Internet has an ideological problem in that anonymity is given a high priority, which is a mistake. Metcalfe feels the ability to have anonymity should be an exist, but not as the default. He talked at length of the pervasiveness of Ethernet into various horizontals. For example, while Ethernet was designed to be a LAN in a building, it has also entered the WAN by killing SONET, an accomplishment he has taken significant pride in. SONET and T1 were both introduced by AT&T, the other ‘big bad corporation of the time’. At 1.544 Mbps, a T1 circuit was half the speed of the original 2.94 Mbps standard, and it was only a matter of time before future Ethernet standards would prevail despite the emergence of X.25, Frame Relay, and ATM. Today, across the WAN, Ethernet is represented as Carrier Ethernet in a $34 billion market of equipment. And of course Ethernet has also manifested itself wirelessly as WiFi. Startups out of research universities are the most effective at innovating. However, they also depend on funding agencies like NSF and DARPA, research professors, graduating students, scaling entrepreneurs, strategic partners (such as the large network vendors like HP), and early adopters. Startups need partners to scale. Large companies need to practice open innovation, and be receptive to ideas that come from the outside. Intrapreneurship – Here, innovation comes from inside the company. 3Com never had a research division, but tried to push its product groups out to find a prospect. In such cases often the money making groups try to kill off the research group because they don’t generate any revenue and there is pressure at every budget cycle. Spin-in, where efforts to come up with innovation are put up outside the company with the understanding that if it succeeds, it will come back to the parent company. We’ve seen that with Insieme. Spin-outs, where the company has to decide whether it will be hostile to the spin-out or supportive. Metcalfe talked about how Xerox noticed that Adobe, Apple, Sun, 3Com were all exploiting technologies (such as the mouse and the GUI) that were developed at PARC. At that point Xerox started investing in their spin-outs rather than being hostile to them. Metcalfe said corporate research has deteriorated a lot since his days and should not be reconstituted. While Xerox PARC is now known as PARC, it is nothing like it was forty years ago. For its strength of 25,000 employees, the now defunct Bell Labs ‘only’ had the transistor, Unix, the Princess telephone, and DWDM to show for. (I’m not the first one to note that Bob Metcalfe tends to make controversial statements!) He argued that the only companies that can afford to undertake research (not development, but science) are monopolies. And as was seen at Xerox PARC, monopolies are the least motivated to scale up technologies that they develop. Funds should not be put in corporate research labs or government research labs. In his opinion research should be left up to research universities, such as UT Austin, Berkeley, and Stanford. Professors should be encouraged to start more companies. He claimed to have a short attention span to re-spin his career every 10 years, from 3Com to Venture Capitalist to Professor. Isn’t it fun going up a learning curve? He finished by saying he recently learned Python in a Massively Online Open Course (MOOC) that he took with his son and 60,000 other students (he got a 90, his son got a 70).